STARKVILLE, MISSISSIPPI — George Phillips took us to a series of Starkville outcrops today straddling the Cretaceous-Tertiary boundary. The boundary here is gradational and generally marked by a color change from gray in the upper Prairie Bluff Formation to light brown in the lower Clayton Formation. Since we want to collect fossils just below and just above the boundary, these localities were ideal for us. 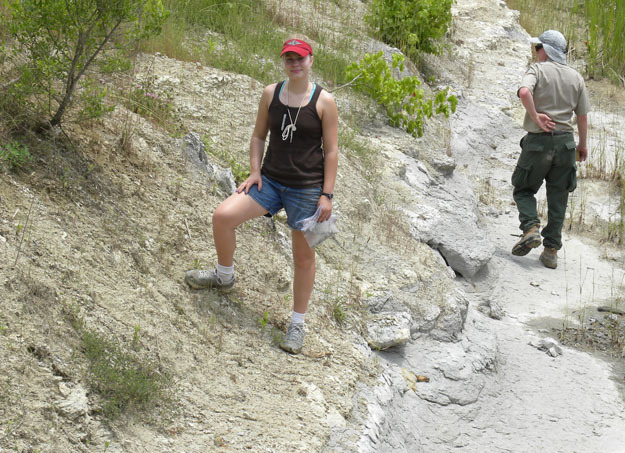 Megan Innis and George Phillips at the Cretaceous-Tertiary boundary in Starkville, Mississippi. We were able to collect many encrusters and borings above and below this fateful event horizon. I was most impressed by the diversity of encrusting foraminiferans on shells and phosphatic pebbles on both sides of the K/T, apparently showing little effects of the extinction. A long time ago I did some systematic and paleoecological work with this group, so I may return to them to test these observations. We also noted the proliferation of tiny oysters (especially Pycnodonte pulaskiensis) in the Clayton sediments immediately above the extinction horizon. These are part of the initial survival and recovery fauna and thus keys to the future repopulation of this shallow marine ecosystem. 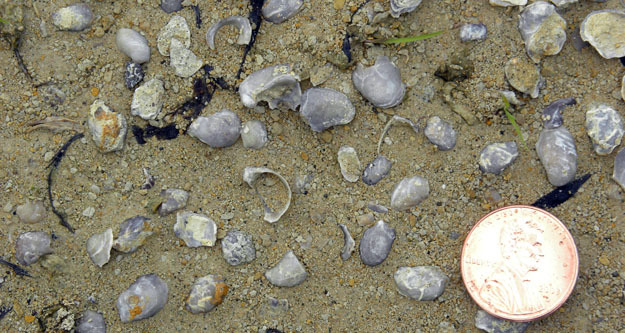 Small oysters in the lowermost Clayton Formation (Paleocene) in Starkville, Mississippi.